A blog full of bits of historical information, comments & observations, photographs (old and new), oddball ramblings and other totally random stuff. Here we are, the Gould kids, in 1948 or 1949. I don’t know why it’s called a shelter-half – or a pup tent, for that matter. I asked my neighbor, who’s nearly 90 years old and was in the military; he said it has to do with each soldier carrying half the stakes and poles so when they paired up, connected their ponchos and draped them over the center pole, they had a full tent! He also thinks that “dog” is an old slang term for a soldier...and that maybe it all does make sense when you add it up! Anyway, I’ve promised him a Milky Way candy bar if he’s right (his favorite), so let me know. ...I remember the smell of it, especially when the sun warmed the canvas: a kind of damp, musty smell (which must have put my brother’s asthma into overdrive, but I don’t remember that happening). And I remember lying inside it with my head facing out, smelling grass and dirt; I remember our cocker spaniel, Ferdie, barking at it, convinced it was an intruder of sorts; I remember, too, my father, crawling in with me and spending the night once—my first camp out! ...the sweetness has to do with a time and place long gone by, an age of wonder and promise and youth, and that lovely border of iris in my grandmother’s back yard; a sudden understanding that I inherited that love of iris from her, and, to this day, have borders and beds of it in my own back yard, sixty-five years later. Aw that is sweet. That's the kind of scene that as a mother I would want to swoop that child up and smooch her little pudgy cheeks. And iris borders are so alluring. Nothing like a long perennial bed bordering a yard. You're right on both counts, Wendy! My Dad bought at least 2 or 3 pup tents from an army surplus store after the war and we actually did set up a pup tent once of twice in the backyard. 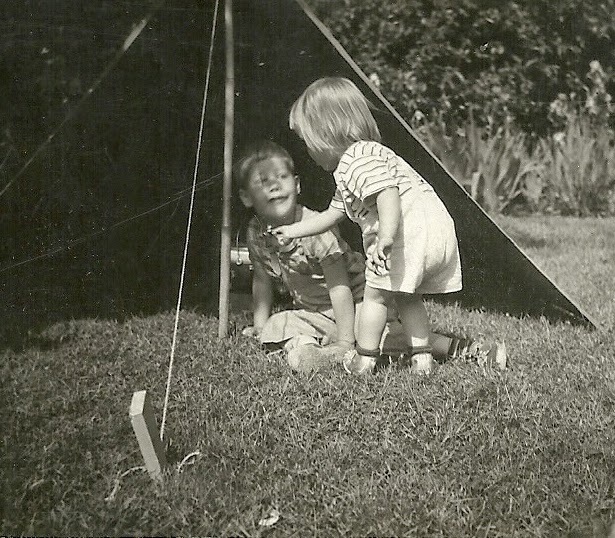 But it was small & hot inside so we usually snapped several pieces of the tents together & threw them over the old swing set frame to make a bigger, more airy tent which was easier to play in. I love the photo. As you say, a single image can evoke so many memories. Lovely photo and you evoked some very sweet memories. It’s funny how the very smell of the tent can stay with you and remind you of happy childhood days. Oh, yes -- smells! Sniff something and get tossed back in time...and remember a place or person you've nearly forgotten. I remember the smell of a tent in the sun too. It seemed like the tent was more like an oven than a shady place. Your comment made me think of my "E-Z Bake Oven," a child's play oven that actually cooked things with just a light bulb for heat source -- remember those? The photo of the week so far for me. A delightful post Deb, and so evocative. Sepia Saturday does, indeed, put us in touch with that side of ourselves! You write beautifully. Your posts are always so enjoyable. There's only one way to respond to your comment -- thank you so much! You're right. The sense of smell is so intertwined with visual memories, but not often the first part of a memory. But yes, the canvas when it got wet. A distinct smell. And the sound of the rain on the canvas. Another good memory. Thanks for reminding me. Oh, I'd forgotten that sound -- rain on the canvas! Not like rain on glass; more of a dull sound than that...pattering, I guess. Great photo from family archives. You were very busy at play. Do kids play like that today? I'm not sure -- I think a lot of them are inside, playing on computers...maybe they all need an afternoon in a pup tent! By then, I find that the steps in front of a house was almost always the favorite spot to take pictures, so homey too were these pictures. In the early 1800s, five families settle on the Eastern River in Pittston, Maine. Together, they build a strong and lasting agricultural neighborhood based on New England values of community and reciprocity. Both fiction and social history, The Eastern flows through the experiences and truths we share with those who have lived before us. For more information, click on the cover! You can look for posts every weekend, and I might occasionally pop up during the week. Let me know what interests you, what catches your eye and/or your imagination! Copyright @ 2012 Deb Gould. Simple theme. Powered by Blogger.